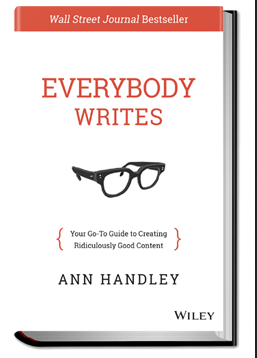 I read “Everybody Writes” a few years ago when I interviewed Ann at Content Marketing World. I decided that my own writing needed a bit of improvement, so I descended on Ann’s book with my trusty highlighter. Ann’s book on writing is the book that professional writers read for inspiration and instruction. Ann is a respected marketing writer and the Chief Content Officer at Marketing Profs. She’s a brilliant educator and an amazing speaker. I’ve seen her speak many times at conferences and she’s awesome every time. Here are a few of my favorite sections from Ann’s book. Ann’s words are indented and italicized. My personal notes are directly below Ann’s words. They may or may not be exactly what Ann intended, so you should consult the book for full context. I love the distilled insight here. This would be good on a coffee mug. I am a writer. You are a writer. Everybody writes. So true. I am amazed at how many people will ask me to review something for them because “I’m not a writer.” Sure you are. Ann and I were both journalists early in our respective careers. You learn a lot about writing when you have to do it on a deadline. Your writing gets better with practice. Every bit of content you create should be to please the customer or prospect — not your boss. This is a tricky one because your boss is often the last checkpoint before marketing content gets published. Marketing writers have to advocate constantly for the customer. If you test your content using analytics, you’ll get some insights about how to write content that pleases your customer. Content created merely to further search engine ranking is a waste of time and effort. What matters now is creating useful content that solves customer problems, shoulders their burdens, eases their pains, enriches their lives. Search engine optimization is important, for sure. Check to see how much of your inbound traffic comes from search engines. There are a lot of ways to get customers to your owned website properties. Don’t be overly reliant on search engines. They don’t tend to buy things from you. Help them find answers to the problems they have. At least help them if they are trying to learn about your brand. This is a basic step that’s often overlooked by copywriters. Do some research. You are not your customer. You learn this in screenwriting too. It’s not really the same idea, but in a way, it kinda-sorta is. Read the book and it’ll make more sense. Align story and strategy. Tell a specific, simple story really well, aligned with a bigger idea and broader strategy. I love this. Your content has to be clear, specific, and strategic. No one will ever complain that you’ve made things too simple to understand. Of course, simple does not equal dumbed down. People are busy and there are lots of things competing for their attention. Don’t make people work to understand your sentences. Assume the reader knows nothing. But don’t assume the reader is stupid. I’d rather produce 500 awesome words than 10,000 terrible ones. I’ve produced my fair share of awesome and terrible copy. I read this book to hone my craft as a writer. Storytelling as it applies to business isn’t about spinning a yarn or a fairy tale. Rather, it’s about how your business (or its products or services) exist in the real world: who you are and what you do for the benefit of others, and how you add value to people’s lives, ease their troubles, help shoulder their burdens, and meet their needs. Write your awesome business story yarn. Then go home and write an awesome piece of fiction. You’ll find useful connections between both types of writing. Alignment of story with strategic goals is critical. If you’re writing for a brand, your content should reflect strategic goals for the business. Voice is also the backbone of the overall look and feel of your content. It informs the overall experience you deliver to people — even in things we don’t traditionally think of as marketing. Your brand has a voice. Listen to that voice in your head when you write. Your number one goal is to be useful to your readers or listeners — so make sure you are an advocate for them, and get what they need. Be useful and advocate for your readers. My goal was to improve my writing. 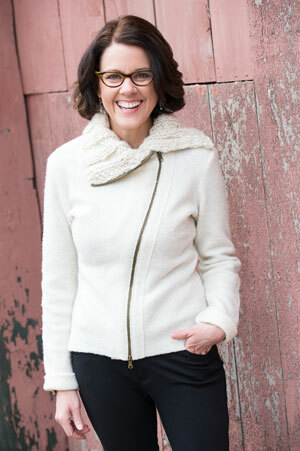 Ann Handley’s educational book “Everybody Writes” helped me inch closer to that personal goal. Ann offers tips and inspiration for writers at all levels. This writing book has earned a coveted spot on my permanent bookshelf. All sections are © 2014 by Ann Handley. Used with permission. This entry was posted in Authors, content, content strategy, highlighted, writing and tagged #contentmarketing, #contentstrategy, content marketing, content strategy, copywriting, highlighted, Marketing, storytelling, writing by Buddy_Scalera. Bookmark the permalink.